Outstanding catering services in Gillingham are delivered by Meek’s Catering Company using locally sourced, home cooked food across Dorset, Wiltshire and Somerset. They have vast catering experience and can meet your needs for event catering in Wiltshire, party catering in Salisbury & BBQ catering in Dorset and the other surrounding areas. Whether you’re planning a wedding, arranging a private dinner party, looking to host a summer barbeque or just require a small buffet for a business meeting Meek’s Catering Company provide reliable, high quality event catering in Wiltshire, Dorset & Somerset, meeting your needs every step of the way. With a wide selection of choices, including vegetarian options, their menus can be suited to any event or occasion. Alongside offering fantastic food Meek’s Catering Company in Dorset can also support your event by providing friendly and professional front of house staff & servers to ensure everything runs smoothly, giving you one less thing to worry about. Disposable platters, plates, cutlery and napkins can also be included in any party catering or event catering package if required and a crockery quotation can be offered upon request. 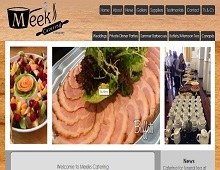 If you are in need of a professional caterer in Shaftesbury, catering services in Gillingham, event catering in Wiltshire, BBQ catering in Dorset, party catering in Salisbury or any other catering services in the entire Dorset, Wiltshire and Somerset areas contact Meek’s Catering Company today to discuss their wide range of catering services.